Caravans themselves are wonderfully quaint little homes on wheels..well some of them are parked permanently in place in the "caravan parks". Caravans are wonderful affairs for outdoorsy people and people with children. And, yes - children think it is really exciting and different to sleep in a caravan! I speak from personal experience here! While the caravan towed behind the car is still a common sight in Scotland, Caravan Parks now have every convenience you can imagine, from pools to playparks for the children, nature trails, saunas, solariums, restaurants and access to so many outdoor activities.. 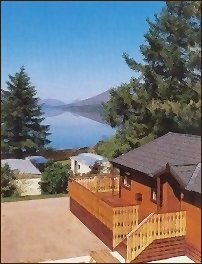 The caravan parks are also more than mere "parks for caravans", they now offer lodges, A-frame houses and each one is available for a virtual tour on an internet site..so you can see exactly where you will be staying. Wow..we've come a long way since my caravanning days!! Imagine waking up to this view in the morning..!